WonderCon returns to the Anaheim Convention Center Easter weekend, March 29-31, for three big days of comics and popular arts fun! After a very successful first event in Anaheim in the spring of 2012, WonderCon Anaheim 2013 will include a giant Exhibit Hall (this year in Halls A and B of the Convention Center), multiple programming tracks, plus the Masquerade, Anime, Games, and much more. Early details on the event include fourteen special guests who have been confirmed for the March show: artist Julie Bell, Jane Espenson (writer/producer, Firefly, Buffy the Vampire Slayer), Dean Koontz (author, Odd Thomas series, Frankenstein series), Jim Lee (artist, Justice League, DC Comics co-publisher), Marjorie Liu (writer, Astonishing X-Men), Doug Mahnke (artist, Green Lantern), Ann Nocenti (writer, Catwoman, Katana), Jason Palmer (artist/illustrator, Indiana Jones Blu-ray set, Serenity, Star Wars), Dan Slott (writer, Superior Spider-Man), Jeff Smith (cartoonist, Bone, RASL), Jim Steranko (writer/artist, Nick Fury, Agent of S.H.I.E.L.D. ), artist Boris Vallejo, and WonderCon friends cartoonist Sergio Aragonés and writer Mark Evanier. Visit the WonderCon Anaheim Special Guests page for more details! 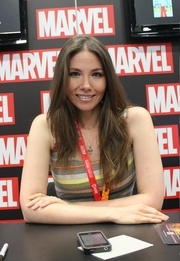 Marjorie Liu signs In the Dark of Dreams. ; C. L. Wilson signs Crown of Crystal Flame (Tairen Soul). Marjorie M Liu discusses Her work. Marjorie M. Liu is currently considered a "single author." If one or more works are by a distinct, homonymous authors, go ahead and split the author. Marjorie M. Liu is composed of 10 names. You can examine and separate out names.